Want to be notified of new releases in BigelowLab/ndfd? You can use ndfd to both list available data lcoations as well as retrieve them. For each you must create a suitable query string suing either query_this() of list_this() which are each convenience wrappers. Once you have a query string you can pass it to NDFD() to get the response form the server and store it in an NDFDRefClass object. The contents of the NDFDRefClass will vary slightly depending upon your request. In this example we simply want to list available resources that fall within a specified boundary. Note that we only get a listing of locations where we can query for data. We can get forecast values by passing the above locations to a subsequent query. This limit could be an issue if a significant number of points are needed. Alternatively, we can retrieve a subgrid of points by defining a bounding box. We can request results at any resolution, but a coarse resolution is required if to avoid the 200 (within box) point cap. 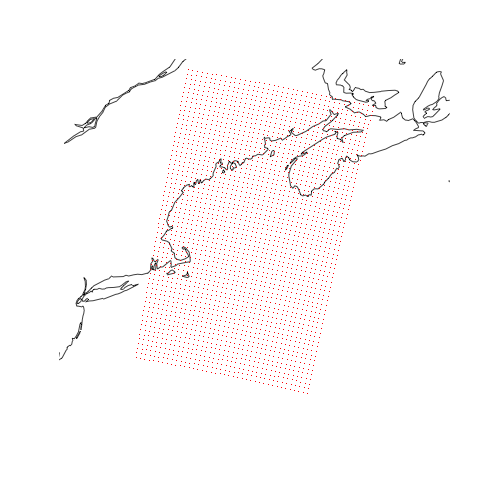 We retrieve the data associated with zip codes in Cumberland County, Maine.